Discussion in 'Discussion and Community Feedback' started by JawJaw, Aug 22, 2018. With Tribal Wars turning 15 years this year we would like to thank you for your continued support. Without you we wouldn't have reached this amazing milestone without you! Your dedication is what allows us to continue working on and improving the game. We are looking forward to the years to come! I am a co-duke in Casual 1 and have some concerns that I hope will be considered before this is implemented on Monday despite this being late Friday night ST already. Let me provide a bit of context. Casual 1, like worlds before W76., have been on a 120 sit limitation rule with decreased sitter function after day 60 with both attacks and supports being limited to only the sat account villages. Recently sits over 60 days received a message when they tried to move troops within the sat account villages that sitters were not allowed to do so. Several ticket were submitted raising some of the concerns and issues. Players who left their account in the hands of a tribemate or friend to go off on a holiday, temporary military service, 8 week sabbatical from their job, or receiving chemotherapy had expectations that their account could at least be self supported and attacked and requests for support could still be shared by their sitter until day 120. In the past when an account was placed in Permanent Sitter Restrictions after the 120 days sat limit had been reached the account would often barb in 7-10 unless it had PP where then it seemed be allowed to continue a bit longer. I have no objection to changes proposed however it does concern me that they were applied to Casual 1 without notice and now it appears the update will occur on Monday the 10th however those players who are away from the game with plans to return before the end of the 120 days will now be surprised to return and find their account on Casual has barbed. I tried to find another situation similar to help me get a perspective on this situation and a couple came to mind. First as a school teacher I have seen many changes in rules for various sports over the years. They are always announced and usually have a comment time for coaches and players to raise any issues or suggestions before they become a part of the official rule book. Players always are advised of the changes before they take to the field to compete. Of course there is a process as well to handle emergency situations that require a rule change but those are few and far between and obvious to everyone as to why the process is on the fast track. Another situation that came to mind is the way traffic laws are changed in my area. There is a lengthy process where all who have concerns can become familiar with the proposed changes and timeline as well as an opportunity to make suggestions and raise concerns. The changes also go through the legal process and are decided by elected lawmakers who are also open to concerns and suggestions of their constituents before the law is passed with a period of time allowed for educating the general public as to what the changes are and when they will take affect. I am very thankful that I have never been subjected to a traffic law changing without being well aware of it before it takes affect. The last example is a simple old-fashioned board game with the rules usually on the inside of the game box. If it has been it while since it has been played then it is normal in my household to do a quick review of the rules and to have them available if anyone needs them during the game. Have we ever made a decision to change or modify a rule in a board game? Absolutely but those playing the game are the ones who suggest and agree to the changes BEFORE they are applied. My concern here is that Innogames has made several changes to rules in Causal 1 to end the world sooner including setting a new end game condition that includes an end date if the condition is not met, the end date has been changed to allow another year, the fake limit rule was changed as well as the rule concerning attack restrictions based on account points. Some have been applied with no notice and some have been overturned when requested while some have been announced as they were applied and some have been applied over time to gradually move toward the final rule. Changes are a challenge in a game based on strategy and if Innogames wants to make that part of the game they sure can but it seems that it should be made very clear on day one how often this will happen and what type of time period will be allowed for players and tribes to make adjustments. Where can the endgame tab be found in casual worlds? 0s0speedy, Dread Doctors and JawJaw like this. @Mintyfresh, what favors/bribes did you give to get this honor? 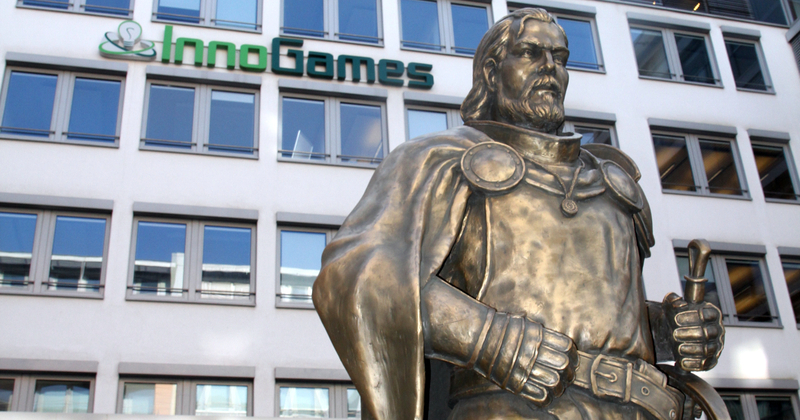 In front of InnoGames Headquarters there is a big statue in the shape of the Tribal Wars paladin. After all, Tribal Wars is where it all began! The Paladin has been named Paul years ago, when the statue was created. Since then, all paladins related to Tribal Wars have always, internally, been named Paul: Paul the Paladin. Mintyfresh and Jirki88 like this. Lies, it's named after Mellofax. He's a decent player sure, but he's no where near as good as me. Mintyfresh and JawJaw like this. TIL @Mintyfresh has a statue in Germany. The legend grows greater. A how can we disable the highlight on buildings that are needed for missions/quests ?